Carrots are a root vegetable which is bright orange in color and has a sweet tasting juice. It is possible to make carrot juice by yourself at home if you own a juicer, but you can also find it ready-made at certain places such as juice bars or in some grocery stores. 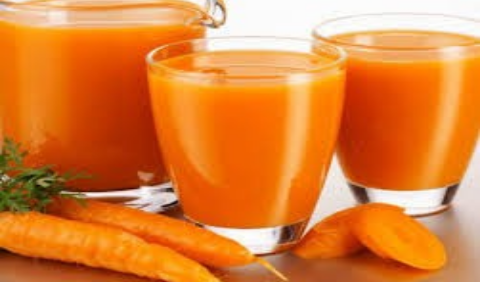 Carrot juice is very healthy and has a great deal of nutritional value. A serving of carrot juice (one cup) has around 80 calories. For those who have the typical caloric intake of 2000 calories a day, this means that a cup of carrot juice will count for around 4 percent of your daily caloric intake. Because of this, carrot juice is an excellent alternative option for water as well as other juices. If you were to compare carrot juice to other options, the same amount of orange juice has 113 calories while tomato juice contains 50 calories. Each cup of carrot juice contains a great deal of the vitamins and minerals your body needs to ingest each day. Vitamin A. When you have a cup of carrot juice, you are consuming 340 percent of your daily recommended dose of vitamin A.
Potassium. In addition to this vitamin, you will also get 18 percent of your recommended dose of potassium in addition to seven percent of your recommended daily value of iron. Vitamin C. Just 100g carrot juice can contain as much as 3 milligrams of vitamin C, a vitamin that is essential for the immune system. Vitamin E. You will also get 0.3 milligrams of vitamin E with each 100g, which is necessary for the synthesis of hormones and to maintain healthy cells. B Vitamins. Carrot juice is also an excellent source of several B vitamins. For 100g fresh carrot juice, it provides 0.01 milligrams of vitamin B1 which is necessary for the nervous system and brain to function properly. It also contains 0.02 milligrams of vitamin B2 which is required to maintain healthy vision and metabolism. Carrot juice is also an excellent source of healthy amounts of micronutrients. Fat. Fat is one of the macronutrients that it is easy to consume too much of and therefore it is good that carrot juice only contains 0.7 grams of fat for each serving of one cup of juice. Protein. MayoClinic suggests that between 10 and 35 percent of the daily caloric intake comes from protein with variations depending on individuals. With a protein content of 1.3 grams per serving, carrot juice provides a nice low amount. Carbs. Most daily meal plans should include between 225 and 325 grams of carbs and one serving of carrot juice will provide 18 grams of these. A great deal of the carrot juice benefits come from its high carotenoid content.